MYRTLE BEACH, SC (WMBF) - When it towered over Horry County, it was Led Zeppelin: The Ride, then Time Machine. 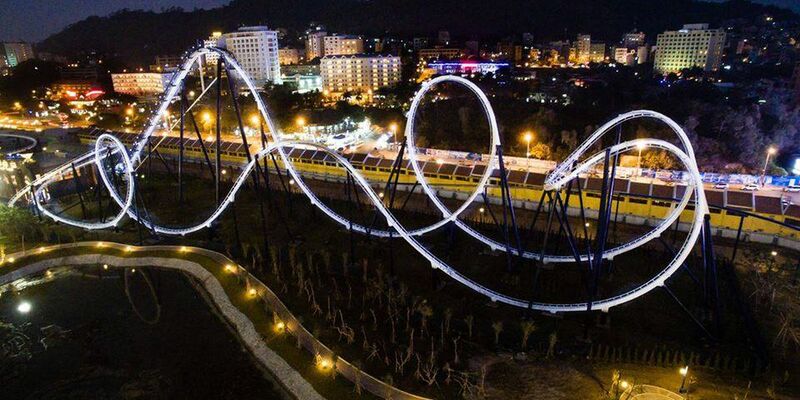 Now, it's Dragon's Run, billed as Asia's longest and most exciting roller coaster. It's the centerpiece of Dragon Park in Ha Long, Vietnam, a park that opened in January. "We knew the layout [of the ride]," said Dennis Speigel, the president of International Theme Park Services, Inc. "It's so dominant, we designed the entire park around the coaster." Speigel's company was tasked with designing Dragon Park. He says it is doing very well in its first month of operation with six to ten thousand visitors on weekdays, and more on weekends. Speigel told WMBF News the Sun Group bought Dragon's Run and several other rides from Myrtle Beach, paying 20 to 30 cents on the dollar. It took some work to get it to Vietnam and make sure it was operating properly. "When you buy used equipment," Speigel said, "you have to ensure it's completely safe." He called Dragon's Run the Cadillac brand of roller coasters, saying his company was very impressed the Sun Group was able to buy it at such a good price. WMBF News has reached out to the Sun Group and the park's managing company Parques Reunidos to find out more about the purchasing and moving of the rides. A Parques Reunidos media release from January 24 calls Dragon Park the largest theme park in Southeast Asia. "The biggest crash we've had in our industry"
International Theme Park Services is based in Cincinnati, Ohio, but Speigel and his team design theme parks all over the world. He also works with investors to find out what works in a park and what doesn't. Shortly after Freestyle Music Park closed, Speigel was asked to perform what he called a forensic post-mortem on the facility. His analysis can be boiled down to this: "It is probably the biggest crash we've had in our industry." "We told them (investors) it's the wrong concept in the wrong place," Speigel said. "It was just in the wrong location. People go to the beach, and it just wasn't in their path. The site was the wrong site." Location wasn't the only problem Speigel noted, calling the entire park "over-priced horribly." Speigel's team did market research on the visitors to the Grand Strand and found tourists weren't coming here to ride rides. "People all had a major theme park which was bigger, better and cheaper," he said. Freestyle Music Park closed in 2009, but the owner of the property, FPI US, LLC, is still paying thousands of dollars in property taxes on the site. According to Horry County property tax records, FPI owns three plots of land. One is the site of the park, two others are small areas where signs for Freestyle Music Park sit. Since 2012, FPI has paid $846,612.78 in real estate taxes on the land and another $370,226.17 in personal property tax on the address 211 George Bishop Parkway. The land the park used to sit on, and the buildings still on that land, was most recently appraised to be worth $11,999,990. The South Carolina Secretary of State's Office records show FPI US, LLC is in good standing with the state. Jennifer Tedlock is listed as the registered agent for the limited liability company. When reached by phone, she hung up before answering any questions. WMBF News has learned there are no plans in place for foreign or American investors to visit the site. Myrtle Beach Mayor John Rhodes says he's waiting to hear from investors once interested in revamping the park.